OUR MEDIA TRAINING FOR ATHLETES GOES BEYOND SIMPLY PREPARING THEM FOR MEDIA INTERVIEWS. WE HELP ATHLETES SHIFT THE WAY THEY VIEW THEIR PUBLIC COMMUNICATIONS AND KNOW HOW TO PRESENT THEIR BEST SELVES. 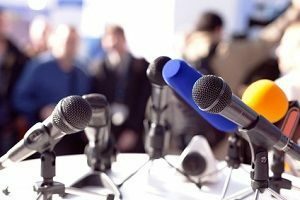 Media training for athletes is about much more than teaching them what to say to please the media and gain more coverage. Athletes are under intense scrutiny any time they’re in public. They need to be prepared to handle this adeptly and strategically, just as they are prepared to excel in their sport. Our media training for athletes goes far beyond tips, do’s and don’ts, and practice interviews. We work with athletes to help them understand the strategy behind shaping their public image and working with the media. • and, when appropriate, speak about sponsors in meaningful ways that make them want to re-up or that will attract more sponsors. • and elevating all elements of communication, such as posture, body language, the use of pauses, and eliminating fillers (“um”, “like”, “you know”), all of which helps the athlete to feel and project greater confidence. Lisa Elia, the lead trainer and founder of Expert Media Training, provides media training for athletes, for both individual athletes and teams. Her approach to training is rooted in her decades of daily work with the media when she booked clients for interviews with ESPN, Sports Illustrated, CNN, GMA and hundreds of other outlets. She finds athletes easy to work with because they are generally driven, they understand that change comes both in small increments and great leaps, and they do the work needed to improve and succeed. To arrange a confidential consultation with Lisa to discuss your training needs, call us at 310-479-0217.